Denny Jump (Bellevue, WA, United States) on 7 October 2012 in Landscape & Rural. The rain poured for 2 days, the temperatures dropped, our middle grandsons football team lost the game but he scored both of their touchdowns..in the rain...in the cold......Then, later in the day at the golden hour, as is often the case, the sun made an appearance and things gor really dramatic, really quick. I was granted permission to get out and take a few shots up the road at a few spots that I felt would have potential... They did. This is from the first spot just minutes from Amy's house - looking Northeast. This ridge is almost always pretty in the fall and it directly faces the setting sun. I thought you might like to start this little series with a "broad shot" jst to give you an idea of the variety of colours seen here. I have about 3 or 4 more from this one panic-stricken photo shoot (I only had about an 50 minutes before the sun would totally disappear). I plan to post a new image every second day. I just knew there had to be a reason for me to take a peek in the middle of the night ... glorious, glorious New England color! Have a magnificent and blessed Sunday! Splendid shot, Denny! Glad you had sun, finally! Sunday is supposed to be partially sunny here! Wow Denny! What a view! Absolutely beautiful! A gorgeous Autumn shot ! We are far behind this schedule where I live, and so for now I happily live vicariously through the beauty of photos like yours. There is the famous Vermont fall color-gorgeous! 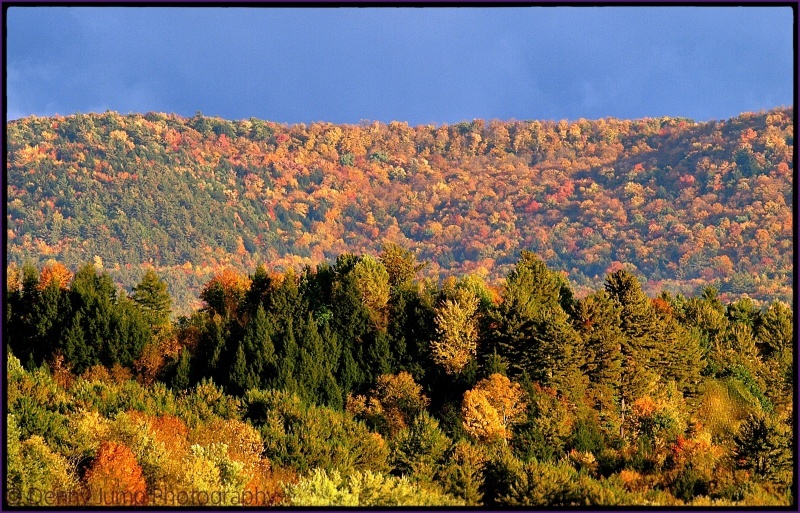 Oh yeah, this is why I want to see Vermont in the autumn. Great shot, Denny. A wonderful full range of natural colors in this aided by what fancy folks call 'aerial perspective' which is that blue business gathering over yonder, Denny. Y'd even get a nod from the 'rule of thirds' police for this one, too ! Pure delight for the eyes & heart ! I was yesterday in a parisian park where i saw stunning colors too, this season is a festival, bravo for yours ! so beautiful Denny, I envy your travels and we are also planning of getting a travel trailer so we can a do a little travel every now and then. You have great photos here. Very beautiful scenery; a real feeling of Thanksgiving!